Does a security system really alarm an intruder? Not unless it includes an Inferno sound barrier. A sound barrier? A high tech device that generates an intolerable spectrum of sound and then broadcasts it at an extreme 125dB. Result - the protected area becomes instantly uninhabitable, forcing the intruder to exit - immediately. Inferno sound barriers protect premises and objects that demand a heightened level of security. They are typically deployed in situations where conventional security alarm systems have/will fail to provide sufficient protection. As the cost of an intrusion is directly proportional to the time available to the intruder, forcing him out immediately - as opposed to filming him - is the best way to limit damage and expense. Forcing him to exit immediately, empty-handed and without confrontation, is surely the ultimate solution to any intrusion. Conventional security alarm systems typically employ a siren which, far from forcing the intruder to exit, simply alerts him of detection. Even if the alarm system is monitored and has instantaneously dispatched a security patrol, the intruder has on average 17 minutes before a security guard arrives on the scene. The intruder depends on this "window of opportunity" that exists between detection, and arrival of security. An alarm system equipped with a sound barrier destroys this window and with it, the intruders' ability to inflict damage and loss. 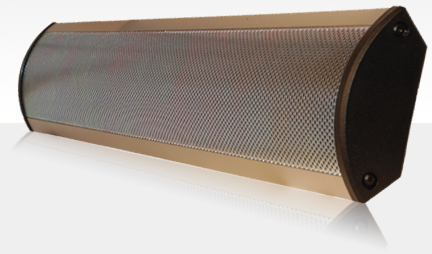 The Inferno range of security sound barriers comprises several models, from the diminutive Micro to the all conquering Intenso (pictured), to the massively powerful InfernoX. Originally commissioned by the Swedish military, they are designed and manufactured in Sweden to exacting standards - making them durable, reliable and most importantly, highly effective. Fully compatible and simple to retrofit, they significantly upgrade the effectiveness of existing alarm systems, providing protection from 35m² to 800m². Several do not require mains power, making them ideally suited to mobile or remote security installations. Inferno sound barriers - take the power back.